Above photo is marinated octopus, cucumber and wakame seaweed in vinegar sauce. I call it tako-to-kyuri-to-wakame-no-sunomono, but I think you can just call it tako-su. It’s typical summer salad (or should I say side dish) in Japan. It is hard to find octopus legs in Perth, but in Japan we eat it very often. If you go to kaiten sushi bar you’ll see octopus sushi, which is a nigiri sushi with a slice of cooked octopus leg. Octopus leg is always available at supermarket too. It is usually sold cooked though. I don’t get to see raw octopus legs much over there unless I go to a fish market. I think octopus legs are kind of gross food here? That’s why I can’t buy it from any grocery shops? Most Asian grocery shops don’t sell it too. I usually buy it from seafood shops. Soak wakame in water until soften, and drain well. Slice cucumber thinly. (or thick if you prefer crunchy texture) Slice cooked octopus leg. Slice ginger into long matchsticks. Mix vinegar, sugar, soy sauce and ginger. 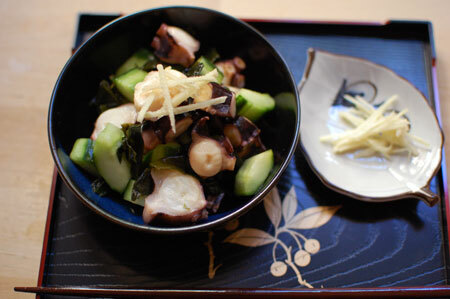 Marinate octopus, cucumber and wakame in the dressing in the fridge for 1 hour or more before serving. « IKEA Food for FREE! It’s hot ~ ….. I’m very weak against the heat. I can just eat watermelon everyday for 3 meals! … if I’m not carrying this cauliflower-sized bub in my belly. 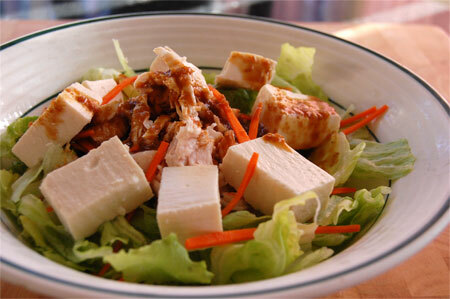 Now, salad is a perfect dish to cool my body down and it also gives me great nutrition. 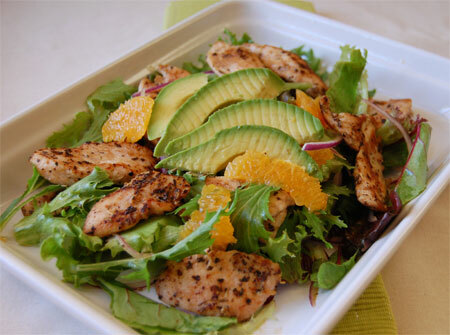 This is one of my favorite salad – grilled spicy cajun chicken with citrus and creamy avocado. You can also add pitted olives, cucumber, sun-dried tomatoes, capsicum etc etc for extra texture and color. Meanwhile, slice onion very thinly. Segment the orange (take out the flesh from the skin). Reserve the juice. Wash lettuce and drain. 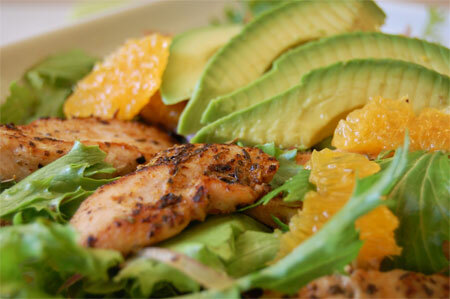 Place the lettuce, onion and orange segments in a clean mixing bowl. Heat a frying pan over high heat, and grill chicken until cooked. Transfer the chicken to the mixing bowl, and pour orange juice and 1 tbs olive oil. Sprinkle salt, and toss gently. Immediately arrange on the serving plate. Top with sliced avocado. 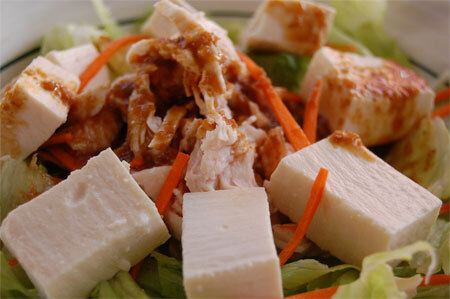 * You can use your favorite salad dressing instead. 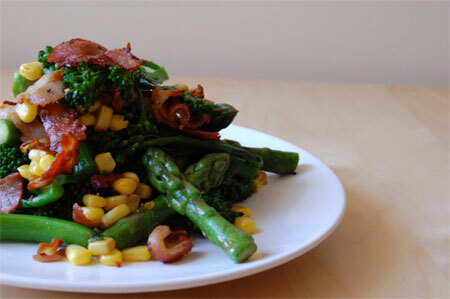 Branched greens and crispy bacon salad. Boil water in a large sauce pan. (you can add salt to the water when you put the pan on the stove) While waiting for the water to boil, cut broccoli and asparagus into 2~3cm long. 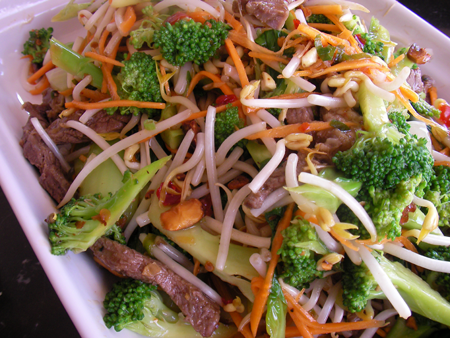 Branch broccoli in the boiling water, then scoop out and drop into a bowl of cold water to stop the cooking process. Drain. Repeat with asparagus. Never leave broccoli and asparagus in the cold water. Slice bacon into 1cm wide. Place bacon on a frying pan (no oil) and turn on the heat. Cook over low to medium low until bacon is golden and crispy. Turn off the heat. Wipe off any excess fat, and turn on the heat again, to high. Add broccoli, asparagus and corn, then stir through. Turn off the heat. Squeeze lemon juice (or orange juice) over, and season well with salt and black pepper.